The Bed Scale 1000 employs the latest in microprocessor and load cell technology to provide accurate and repeatable weight data. Four (4) identically matched transducers are strategically placed to ensure an accurate representation of the patient's weight regardless of weight distribution. Sets the initial sytem zero reference. 1. Press and Hold the "0.0" button. The displayed message will indicate " HOLD TO ZERO " as the digit to the right counts down. 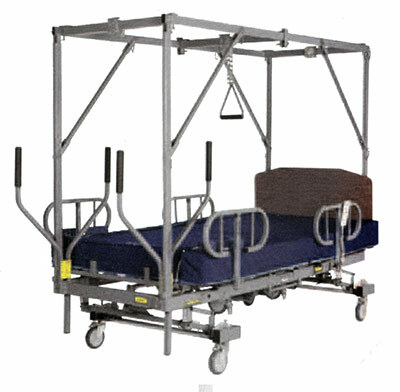 "WEIGHT = 000.0 LB "
The patient may now be placed on to the bed. IMPORTANT: When the "0.0" button is pressed, everything on the weighing surface will be zeroed out on the display. Make sure that all linens, pillows etc... are in place before pressing the "0.0 " button so that they will not appear as part of the patient's weight. After the patient has been placed on the bed, simply press and release the " ON " button. The displayed message will read "PLEASE WAIT - HANDS OFF". Do not touch the bed. After a few seconds the patient's weight will be displayed. 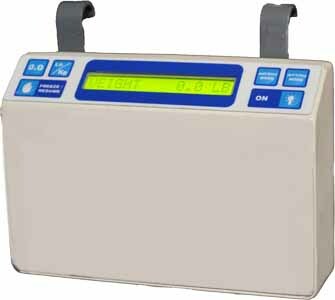 The WEIGHT CHANGE mode is used to monitor the patient's weight relative to ZERO. 1. Press the " WT CHG " button. The display will read" WT CHG=(patient weight)". 2. Press the "0.0 " button to set the relative zero. Any variation in weight will now be viewed as a "+" or "-" figure relative to ZERO. Pressing the "WEIGHT" button will switch back to the WEIGHT MODE allowing you to view the patient's total weight again. NOTE: When you reset the system zero, the WEIGHT CHANGE MODE will also be reset to zero. 1. Press the " FREEZE/RESUME" button. The display will read " FREEZE = (patient weight) ". 2. Press the " FREEZE/RESUME" button. The display will read " FREEZE = (patient weight) ". While in the FREEZE mode, the "WEIGHT" and "WT/CHG" keys will allow you to manually adjust the displayed weight reading in the event of a known error. Simply press the "WEIGHT" and "WT/CHG" keys to make the proper corrections. NOTE: If FREEZE Mode is left unattended for morethan 3 minutes, display will read " LEFT IN FREEZE - REFER TO MANUAL". You must press the " FREEZE/RESUME" button to exit this mode. Toggles between POUNDS and KILOGRAMS display modes. 2. Make all necessary adjustments to bed and/or patient. 3. Press the "FREEZE/RESUME" button once again to resume normal weight monitoring. 1. Note the displayed patient weight before removing batteries. The display will toggle the message " POWER INTERUPTED" - "PRESS FREEZE". a) Press the "FREEZE/RESUME" button. The display will read "FREEZE = (patient weight)"
b) Use the "WEIGHT" and "WT/CHG" keys to ramp the displayed value to the correct weight. weighing mode. If you make a mistake, press "ON" to abort your changes. REMOVE THE PATIENT FROM THE BED AND RE-ZERO THE SYSTEM. IMPORTANT : The following calibration procedure should only be performed by qualified service personnel. The 1229B load cell, itself, has no user serviceable components and should not be tampered with for any reason. Recalibration is generally not required, but should be checked periodically to ensure accuracy. Press and Hold the "Weight Mode", "Wt/Chg" and "On" Simultaneously. The Display will read "Hold to Init" and count down from 9 to 0 (zero). Release the buttons and the display should read "Initializing". 1. Press the"FREEZE/RESUME" button to enter the FREEZE MODE. read "CAL" as the right hand digit counts down to enter the CAL MODE. side of the display. This number is the "Offset" of the bed. This number should be positive and between 40 and 100 Pounds with bed ready for patient (but no patient in the bed). On PCB1857C2, use R13 to adjust the Offset to proper range (+40 to 100 lbs). Then Press Zero. 4. Place a known weight on to the weighing surface and compare it to the displayed reading. 5. Use the "WEIGHT" and "WT/CHG" keys to make any necessary adjustments to the displayed value. 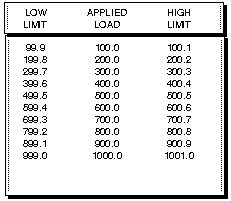 The displayed value should be within 0.1% of the calibrated weight plus or minus 1 digit of reading. 6. Press "FREEZE/RESUME" to save the changes or "ON" to abort changes. The readout and transducer housings for the 1229B Scale System are made of aluminum and steel with a painted surface. You need only exercise caution when cleaning the display window as this is made of clear polyester . We recommend mild soap and water for general cleaning. Display Type 16 character dot matrix L.C.D. Display Time Auto power-down 60 sec.